Global Economy Matters: Spain Emerges From Recession? 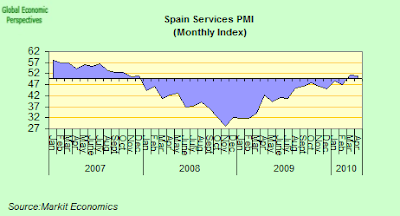 Well it is now official - or at least as official as it is going to get: the Spanish economy sneaked back into growth by a short head during the first three months of this year. According to data published in the Bank of Spain's quarterly report on the Spanish economy, Spain's GDP grew by 0.1% in the first quarter. Interannually output was still down by 1.3%, but this is evidently a considerable improvement on the 4.2% annual drop registered in the second quarter of last year, and much better than the 3.1% fall seen in the last three months of 2009. 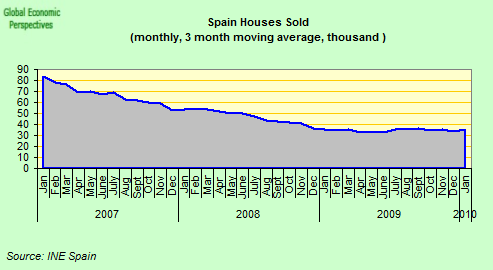 So basically the situation is simply an extension of the one described in the following chart (produced by the Spanish statistics office to accompany the Q4 2009 data), where as can be seen the roles have reversed rather, with domestic demand ceasing to be such a drag on the economy, and net external demand having an increasingly negative impact. 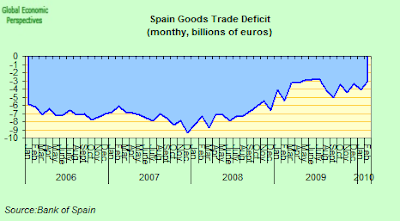 As we will see in the analysis which follows, there is plenty of evidence to support the idea that domestic demand has been stabilised (with a huge injection of demand from the government), but the external position is rather more confused, and doubly so given the existence of a slight discrepancy between trade data published by the Bank of Spain (in their monthly report on the Balance of Payments position) and that sent by the government department of trade to Eurostat, and hence to the World Trade Organisation. 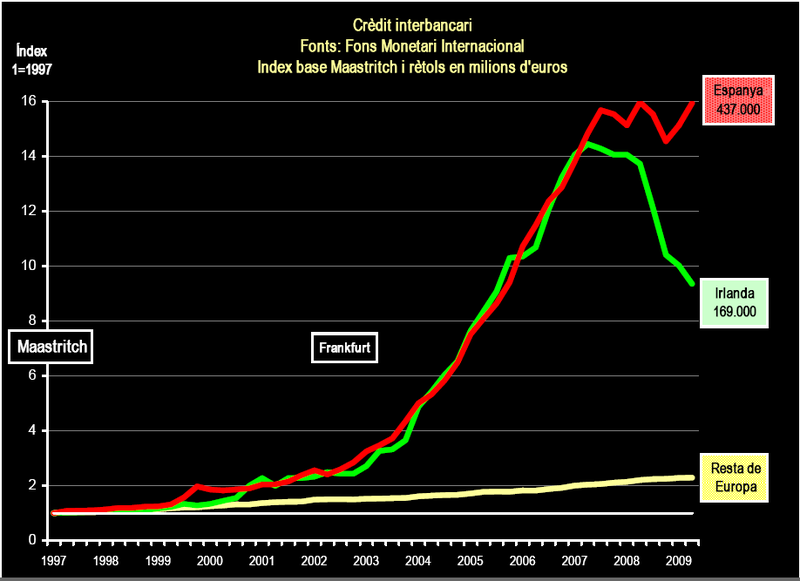 In fact the export data published by the two organisations more or less coincide, since the WTO report February exports as 20.522 million USD (or about 15.8 million euros), while the Bank of Spain reports 14.196 million euros (or about 18.5 million USD using the same exchange conversion rate). 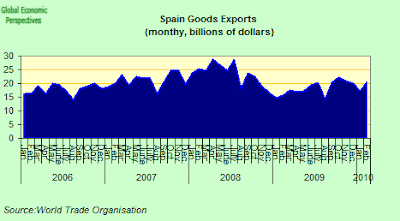 When it comes to imports, however, the discrepancy is rather more important, since the WTO (via, I emphasise Eurostat) offers us a February volume of 27.727 millones USD (or around 21.3 million euros) while the Bank of Spain records 17.251 million euros (or about 22.42 million dollars). On the other hand, the chart I made using WTO data (below) gives a rather different impression: the deficit clearly deteriorated even further in February (this is the latest month we have). Now none of this would really matter, if it weren't for the fact that the level of GDP growth being estimated is only 0.1%, and thus a small variation in the trade deficit could easily make the difference between zero and slight positive growth, and given the propaganda emphasis being placed by the Spanish government on the return to growth we need to be rather careful at this point before drawing too many conclusions. To be very clear: I am not in the least suggesting that there is any kind of "black hand" at work manipulating the data here, I am simply pointing out that due to whatever reason (the respective reporting period in question, earlier and later estimates, or whatever) this discrepancy exists, and it does seem to me to be significant. The real problem here, as in the case of the unemployment data which was the subject of another recent post, Spain's reporting agencies are quick to point out any item in the data which shows the Spanish economy in a positive light, while they have the frustrating custom of passing over in silence any inconvenience. 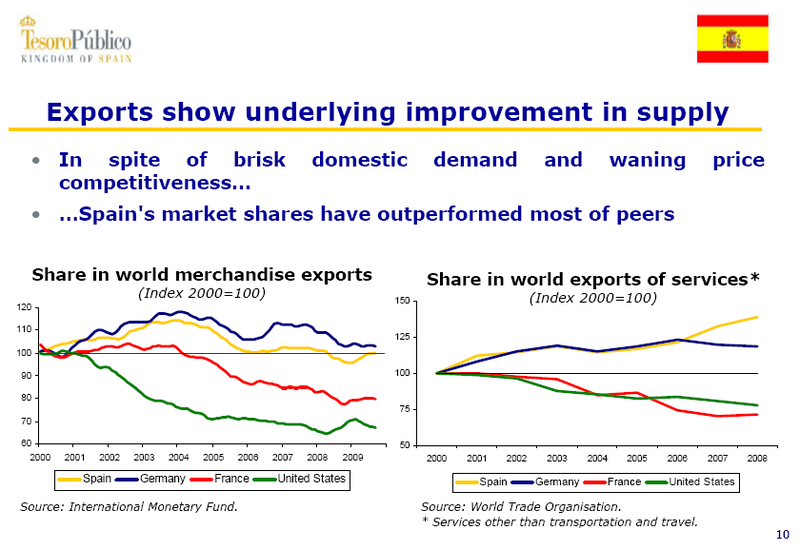 Another good example of this was the claim made in the Kingdom of Spain February roadshow in London, that between 2000 and 2009 Spain's share in world exports actually increased (implying that, there you see, Spain is not so uncompetitive after all), without mentioning that over the same period the trade deficit worsened considerably, which means that Spain's share in world imports increased even more, or if you like that Spain became a major global imports powerhouse - there, that didn't sound so impressive, now did it? 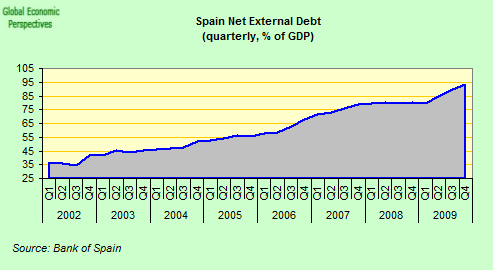 As I say, a combination of strong fiscal support from the Spanish government and ample supplies of liquidity from the ECB to the banking system have managed to stabilise the patient. Perhaps the best example of this are the latest PMI readings. 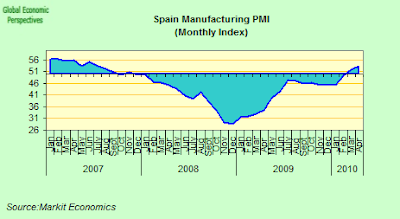 According to the monthly report from Markit Economics in April Spanish industry saw the fastest rise in manufacturing new orders since April 2007, while for the second consecutive month, operating conditions improved throughout the manufacturing sector. The seasonally adjusted Markit Purchasing Managers’ Index – which is a composite indicator designed to measure the performance of the manufacturing economy – rose to 53.3 in April giving its highest reading since June 2007. Positive as this news is, we should not forget that there is currently a government car purchase programme in place, and that many purchasers may buy now to beat the forthcoming July VAT hike. In fact Spanish car sales were up by 39.3 percent year-on-year in April compared with the same month of last year with 93,637 units sold. 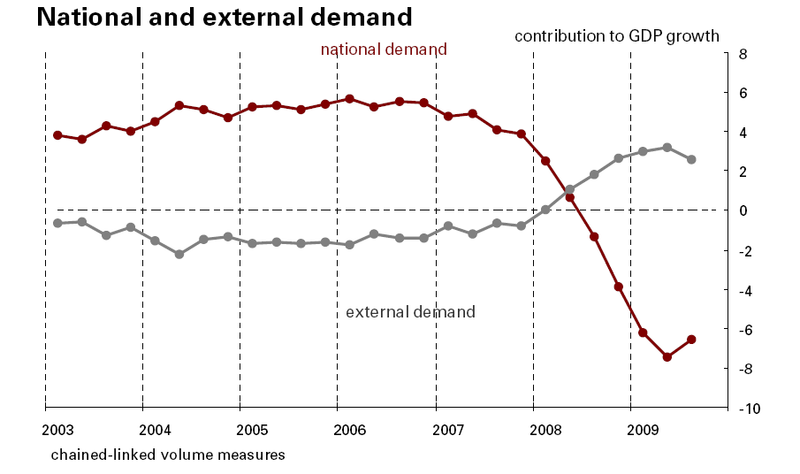 To get some sort of comparison, in France, where scrapping incentives were reduced to a lower rate at the start of 2010, passenger car registrations rose an annual 1.9 percent in April to 191,000 units, compared with 13 percent growth in March, while in Italy, where the stimulus measures have now beem withdrawn completely, the car market fell an annual 15.65 percent in April to 159,971 units. Developments in France and Italy should give us some indication of what to expect in Spain as stimulus measures are withdrawn and taxes rise. 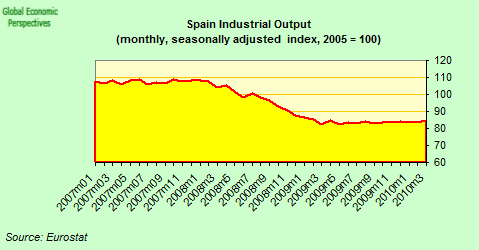 If we look at the actual industrial output chart (below) we can see clearly that although there is ample evidence to justify the thesis of stabilistation over the last twelve months (and even a slight rebound in March), the medicine applied has simply stopped the collapse, and not (in any meaningful sense) restored growth. 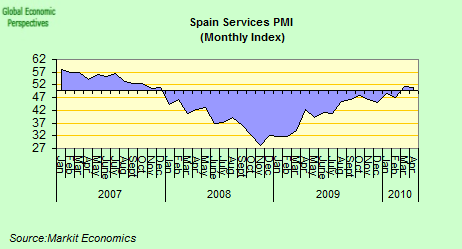 A similar picture emerges for Spain's hard pressed services sector from the April services PMI: the rate of activity growth actually slowed slightly during the month and demand remained fragile, and growth in both activity and new orders was described by the report as "anaemic". The headline seasonally adjusted Business Activity Index – which is based on a single question asking respondents to report on the actual change in business activity at their companies compared to one month ago – dipped slightly to 50.9 in April, from 51.3 in the previous month, to indicate a marginal increase in activity for the second month running. According to survey respondents continued weakness in the wider Spanish economy prevented a stronger rise in activity during the month. 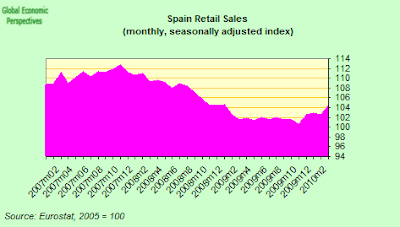 As noted above, a rather more positive picture emerges when it comes to retail sales, since they have rebounded somewhat since the turn of the year, and are now only down by just over 7% from their November 2007 peak (see chart below). The question is whether the demand injection from the government which is supporting this (with unemployment running around 20%, and banks short of liquidity) remains sustainable - especially given recent events in the financial markets. 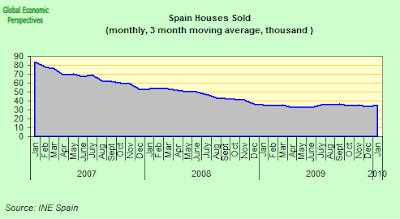 Spain's previously bloated construction industry continues to "downsize", and a further sharp drop in activity was registered in February (see chart below), but this is hardly surprising, since the Spanish economy will now inevitably have to move from being a construction and tourism driven one to having a more broadly based profile. So the continuing demise in construction is a logical and inevitable part of the ongoing adjustment. 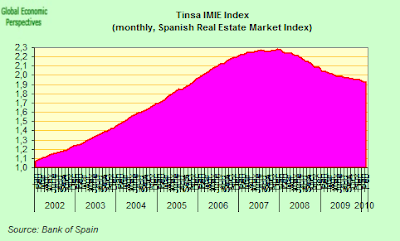 House prices continue to fall, and are now down 16.2% from their December 2007 peak (according to the TINSA index, see chart below). 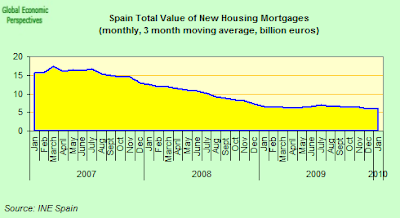 There is obviously still a long way to go in the house price adjustment process, and it remains to be seen for how much longer Spain's more stressed banks can continue to increase their already extensive property portfolios in their attempt to cushion the fall. Both house sales and mortgages have risen slightly during the last quarter, but the picture (see charts below) remains one of stabilisation rther than rebound. 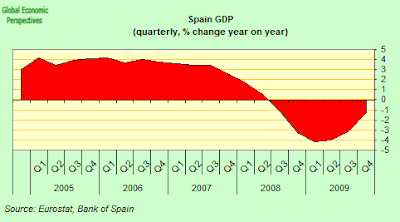 So Spain's economic collapse has been stabilised, but in order to grasp what may happen next we need to understand how it has been stabilised. 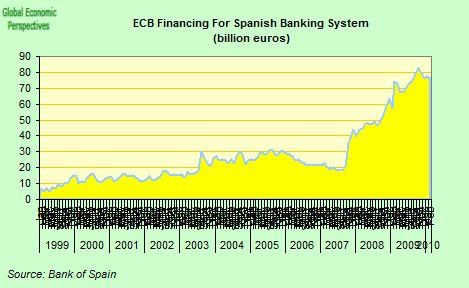 In the first place Spain's banks have been in receipt of a massive liquidity injection from the ECB (see chart below), and it was the imminent likelihood that these would be withdrawn in the coming months that created much of the market panic which was seen at the end of last week. 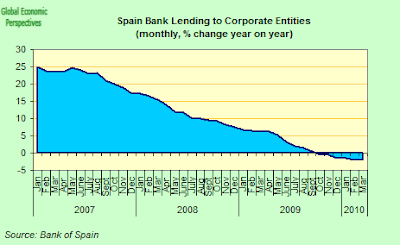 Spain's banks increased their reliance on the ECB's longer term financing operations from 47 billion euros to 79 billion euros between June and July last year, and much of the increase will be need to find alternative sources of funding if the ECB holds to its current exit strategy agenda (which, of course, it now may not do). 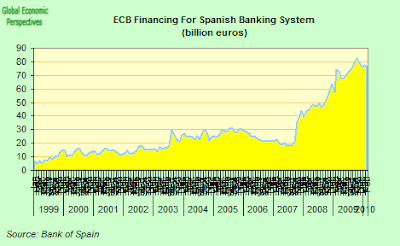 In fact, during the fisrt decade of euro membership, the dependence of Spain's banks on inter-bank funding became huge (see chart), and it is the uncertainty about whether markets are willing to sustain this that is causing the whole Eurozone edifice to tremble at this point. The other part of the life support system that is currently keeping Spain's vastly over-leveraged economy afloat, is the ongoing fiscal support from the Spanish government. The fiscal deficit last year was officially 11.2%, and it looks like this year it won't be too far short of double digits. 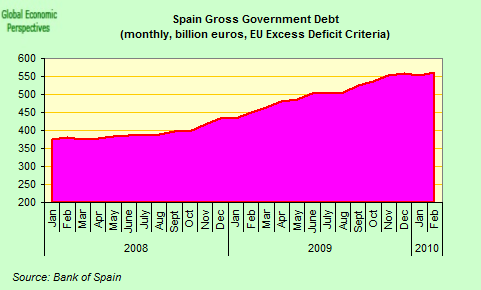 But, as the Spanish administration constantly stress, Spain's basic problem is not a fiscal one, Spain's problem is the rapid ballooning of the fiscal deficit in the context of a heavily indebted private sector. Spanish households, for example, have around 900 billion euros (or around 90% of GDP) in debts. 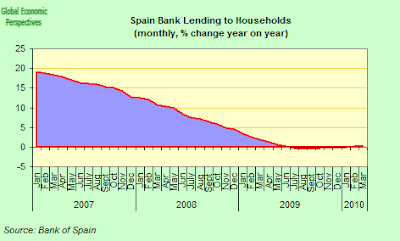 In fact, during the boom years Spain's economy was running on steroids, with household debt increasing at a rate of around 20% a year. Then along came the financial crisis, and all that came to a halt, with household debt remaining virtually stationary (see charts below). As a result, Spain's economy screeched to a halt, and from that time onwards has simply been able to stagger throught from one day to the next. 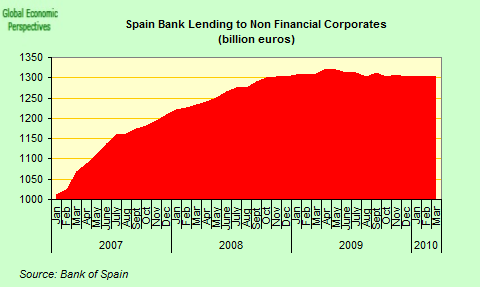 And it isn't only Spanish households who have gotten themselves excessively into debt, Spain's corporate sector also has some 1.3 trillion euros in debt (or 125% of GDP), and again a similar picture is observed (see charts) since the financial crisis set in, the rate of new debt generation has steadily ground to a halt. The response of the Spanish administration to this fairly dramatic state of affairs has not been to make the kind of changes we have seen in Ireland (creation of the bad bank NAMA, serious efforts at a competitiveness adjustment), rather the Spanish government has simply tried to spend its way out of the problem (see chart) in the hope that better days will return. 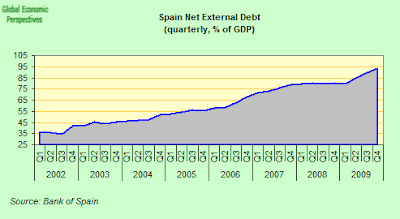 Spain's official outsanding government debt is only around 55% of GDP, but the markets seem increasingly less willing to finance more of it without being presented with some sort of credible strategy for really reviving the economy on a sustainable basis. The key to the problem is competitiveness. 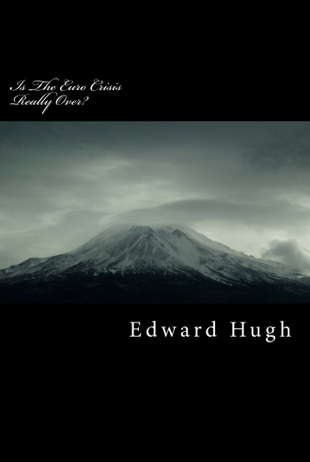 This issue has caused an uncountable number of arguments between "Anglo Saxon" economists, and their continental counterparts. I sometimes feel the issue is almost being taken as a personal one, a question of "honour". Indeed I often find company executives here in Catalonia extremely sensitive on this issue. So let us be clear, the issue is not that Spain's leading global companies and exporters are not competitive in the markets in which they operate. These companies have survived, and to survive they have become competitive. In true Darwainian fashion the fittest have survived. But what about thosxe who were less "fit", what happened to they? Of course, they died, they are no longer with us. And herein lies the problem, since to provide work for the 3 to 4 million people who are steadily being displaced from the construction sector (and the industrial ones closely associated with it) the dead will need to be reborn, and needs which are currently satisfied with imports will need to be met locally. Here is the challenge, and here is the reason many analysts have suggested that what Spain most urgently needs is a wage and price (downward) adjustment. And how do I know this? 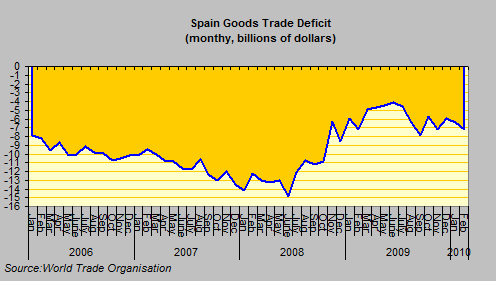 Well just look at the trade deficit above. As Spain's economy has steadily "recovered" this has only deteriorated. Far from a deteriorating goods trade deficit, what Spain badly needs is a goods trade surplus. 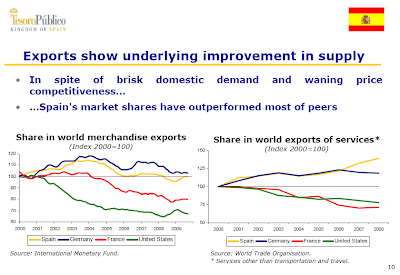 Exports have revived somewhat (especially following the recent drop in the value fo the Euro), but this improvement is far from sufficient, and indeed we are still well below pre-crisis levels (see chart). So month by month, Spain's aggregate national accounts are steadily deteriorating. 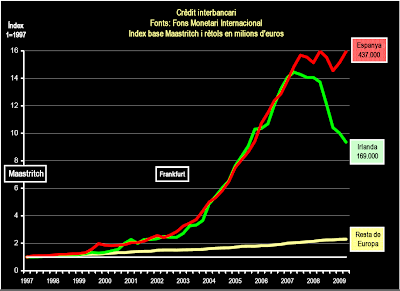 Every month the trade deficit needs to be financed, and the interest on the growing external debt needs to be financed. 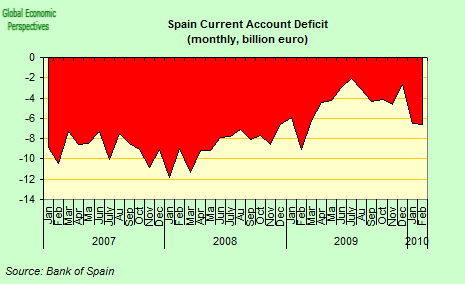 This is why Spain's current account has once more deteriorated, and is currently stuck around 7.5% of GDP. 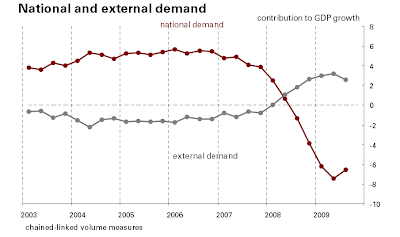 And as a consequence of the continuing current account deficit the level of external indebtedness simply rises and rises. 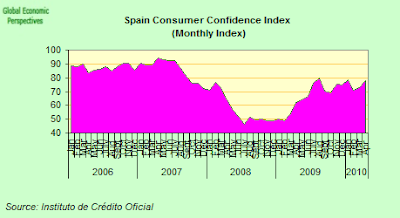 The big danger at this point in Spain is that growing market uneasiness about Spain's external position creates a "debt snowball" not on government debt, but on the ability to finance the country's external liabilities, as lenders demand higher risk premia on interest rates charged, which produces a further deterioration in the current account, which lead the ratings agencies to make further downgrades which only feed market nervousness, and so on, in what could easily become a very vicious spiral. Even more incredibly the expectations sub component surged back up again in April, and is now very close to series historic highs. 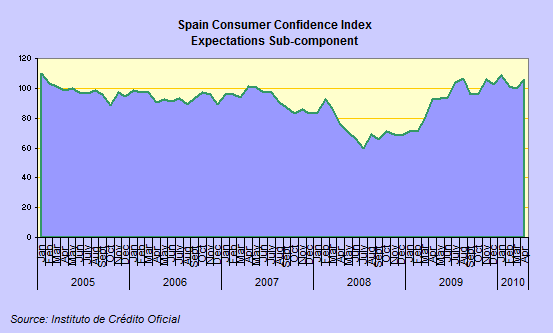 I couldn't say I don't believe this, but I could say that living in Spain and talking to people on a daily basis I do find the result very hard to believe: either Spanish citizens are extraordinarily unrealistic about where extactly their country is at this point in time (which in itself would be hardly reassuring as far as the future of the Eurozone goes), or there is something wrong with the data. 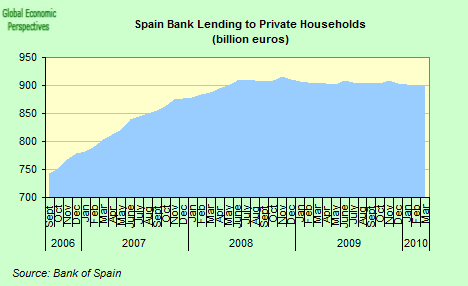 The real issue, however, is to be found in the confidence (or lack of it) of those who lend money to Spain's citizens that they will be able to pay it all back. 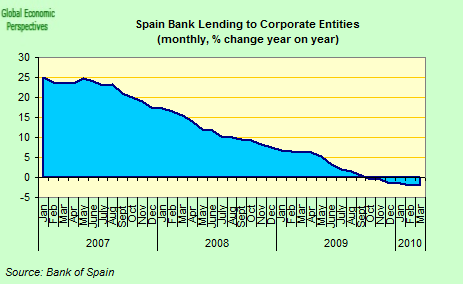 The confidence issue now revolves around whether Spain and its banks now owe more than the country is going to be able to pay back in the longer run. And remember, that even as GDP apparently grew in the short term, the level of external debt to GDP has simply continued to rise and rise. So while there may well be grounds for questioning the rational basis for the opinions reportedly expressed in the ICO confidence reading, there are far fewer grounds for imagining that those investors who are nervous about buying debt with the "Made in Spain" trademark are being other than very realistic. As I say in this post, if the Spanish economy is really to be put straight, and not simply go straight back and do the same again, then surely one major priority must be for public opinion leaders to find the ability and the courage to speak openly and clearly about the Spanish economy's "inner secrets", and the strength of character needed to address the country’s problems in a proactive way - to be out there in front of the curve, and not constantly trailing behind it. If you want to stop a forest fire you put down aggressive faire breaks, you don't run behind it with a garden hosepipe. The problem is - as I say here - with Mr Zapatero constantly denying that Spain has a public debt problem while at the same time persistently failing to address the evident private debt issue, there is a real danger that confidence deteriorates even further, and especially in the month of July, when a large quantity of both public and private debt is due for renewal. “We can’t spend all day paying attention to speculation,” Mr Zapatero said to journalists in Brussels last week. Exactly. Then don’t do it. What Spain’s Prime Minister needs to learn to do is stop answering questions people aren’t asking. The principal reforms that Spain currently needs have been made abundantly clear by both the IMF and the EU Commission, so now is the time to implement them. 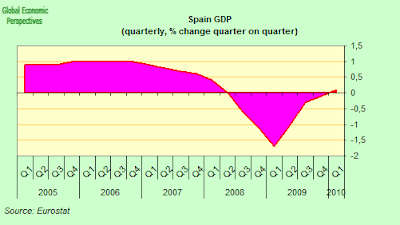 Only this week the IMF urged the Spanish government to be more vigourous in implementing its fiscal correction programme, so why not spell out line by line where the cuts will come? 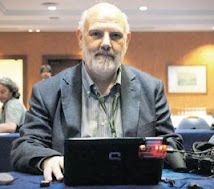 It is no longer sufficient, as Miguel-Anxo Murado so ironically puts it in the Guardian newspaper, to simply say time and time again "all repeat after me, ‘Spain is not Greece’". This is clear to all. What is worrying people is whether or not Spain could become another Greece in the future, and whether or not the country’s present leaders have the determination needed to take the steps to ensure it won’t. Confidence in Spain’s economy is at a low level, and confidence in Mr Zapatero’s ability to do what is needed is at an even lower one. 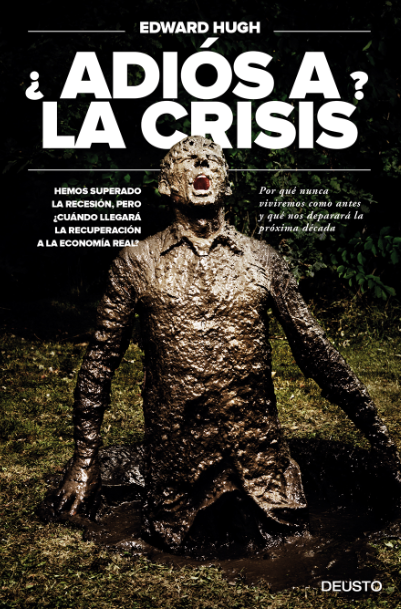 If Spain’s Prime Minister finds he is no longer able to convince external observers that he can do the job which needs to be done, then in the interest of all Spaniards and all Europeans he should offer to stand down at the and of the European Presidency in July and pass the rudder over to someone who can.